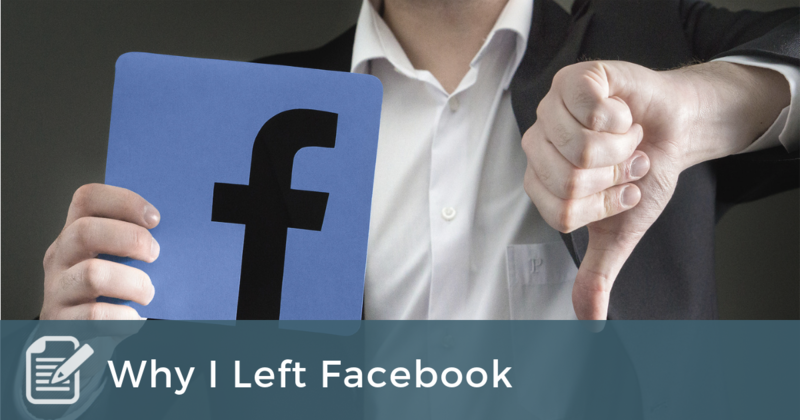 A few months ago, after years of participating on Facebook, I felt compelled to leave. There is lots of data supporting why Facebook is not a healthy connection, including stories of the leaders of these data giants not letting their children use the network. But before I go further, let me also say that I’ve seen positives for Facebook connections. Many up and coming coaches have shared with me that they’ve made connections with other coaches and that has created a supportive network for them. That’s fantastic, and I’m thrilled. I’m also going to continue to be a part of our private Facebook Group that is part of our Community of Coaches. That is an important group that I am happy to participate in. But otherwise, I’m getting off and here are three reasons why. One, signs of addiction were evident. I found that when I had any downtime, a short break in the day or whatever, I would immediately go to my phone for stimulus. I would either go to Facebook or a news app. After spending 15 to 20 minutes perusing either platform, I felt empty and stressed. Downtime should be downtime. It should be a break in connection and allow my brain to rejuvenate. So, in the fall, I deleted both Facebook and my news app from my phone. I could access both on my computer, but I hoped disconnecting from the ever-present phone would be enough. It wasn’t. Two, my Facebook relationships were artificial. Facebook can make me feel connected when I’m not. At a family Christmas gathering, I saw one of my favorite cousins who was only able to bring one of her two children to the gathering. Her son was ill and had to stay home with her husband. I was able to see her five-year-old girl, who I adore and since they moved away, I’ve lost connection. I’m reminded that just because I get to see pictures of the children on Facebook, I do NOT know them, and they do NOT know me. With my usual sarcasm, I said to my dear cousin, “Since I’m not on Facebook anymore, could you call me once a month and give me an update?” She said with her usual inciteful observation (a wonderful trait), “You can always call me.” She meant it too. She wasn’t just being difficult. I can’t promise I will call her, but without Facebook giving me a “fix” of seeing a few pictures of her family, I might just call her and connect and maybe even talk to her children for a few minutes. Could I stay on Facebook AND connect with her on the phone? Of course, but I won’t. Three, these relationships don’t create maturity. There is plenty of arguing on Facebook about plenty of issues, but nobody ever changes their position. Nobody ever grows into a deeper perspective. Of course, I’m exaggerating when I say “nobody,” perhaps I should say “I don’t grow.” Instead, I’m envious, irritated, judgmental, and skeptical. These attitudes expand with my Facebook usage rather than recede. Real relationships communicate through non-verbals, like facial expressions, and through direct statements that are the truth delivered with love. Facebook is terrible at both. I want to grow. The Bible urges me to mature. For me, Facebook hinders this crucial personal development. Should everyone get off Facebook? Maybe, but that is not for me to say. Should you get off Facebook? That’s a better question. It depends. One should weigh the pros and the cons, but one thing I’d urge is that if the cons are high enough, it shouldn’t matter what the pros are. For now, if you want to connect with me, find a way other than Facebook.